BuySoundtrax Records is proud to announce the release of THE JERRY GOLDSMITH COLLECTION - VOLUME 2: PIANO SKETCHES, the second release in their series of new recordings of classics from the composer’s extensive filmography, newly interpreted for solo piano. Jerry Goldsmith was born in 1929 and as a child studied piano, composition and theory. After a stint taking classes in film composition taught by Miklós Rózsa at USC, he attended Los Angeles College. In 1950, Goldsmith was hired by CBS as a clerk typist for the music department. It was at CBS that he would get his start writing music for several television series. In the early 1960s, Goldsmith moved more into the feature film realm, earning widespread acclaim for his score for the western LONELY ARE THE BRAVE and his first Academy Award nomination in 1962 with FREUD. Throughout his long career, Goldsmith would be nominated 17 more times, for A PATCH OF BLUE, THE SAND PEBBLES, PLANET OF THE APES, PATTON, PAPILLON, CHINATOWN, THE WIND AND THE LION, THE OMEN (nominated for original song and earning the award for Original Score), THE BOYS FROM BRAZIL, STAR TREK: THE MOTION PICTURE, POLTERGEIST, UNDER FIRE, HOOSIERS, BASIC INSTINCT, L.A. CONFIDENTIAL and MULAN. He would also earn 5 Emmy Awards, for THE RED PONY, QB VII, BABE, MASADA and STAR TREK: VOYAGER. His credits also include beloved films and cult classics such as GREMLINS, RUDY, THE SECRET OF NIMH, FIRST BLOOD, TOTAL RECALL, BASIC INSTINCT, THE MUMMY, LOGAN'S RUN, THE GREAT TRAIN ROBBERY and ALIEN. Born in South Korea, Joohyun Park began studying music at the age of six at the prompting of her mother. Eventually she received both a Bachelor’s and a Master’s Degree of Piano from Yon Sei University in Seoul, studying with pianist Myoungwon Shin, before relocating to the United States, where she earned a Bachelor’s Degree in Contemporary Writing and Production from Boston’s famed Berklee College of Music. Joohyun's orchestrations and arrangements can be found in PRIEST, DRAG ME TO HELL, CREATION, WHEN IN ROME, LOVE HAPPENS and many other films. A graduate of the UCLA Extension Film Scoring program, Mark Northam is the founder of The Film Music Network, one of the industry's largest trade associations, and is publisher of Film Music Magazine, a leading industry trade publication for the film, television, and multimedia music industry. He has written and taught extensively about the film and television music business while working for a time as a film composer. He continues to write about film music and still regards his piano work as the fundamental part of his musicianship and musical interests. 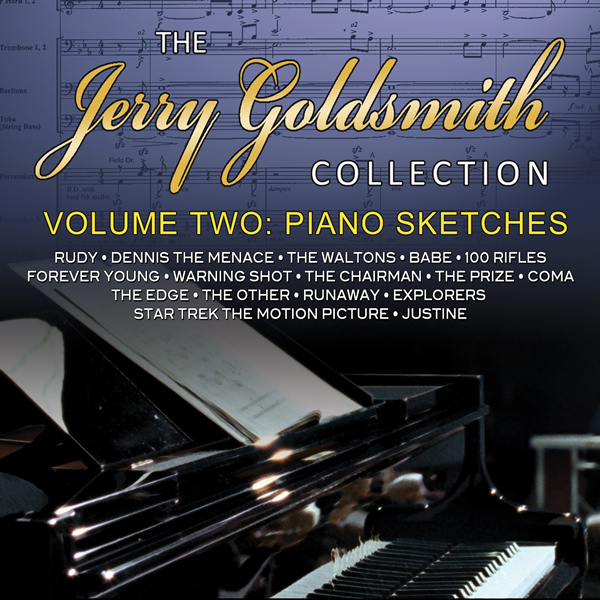 THE JERRY GOLDSMITH COLLECTION - VOLUME 2: PIANO SKETCHES includes liner notes written by author Randall Larson providing insight into the evolution of the album. THE JERRY GOLDSMITH COLLECTION - VOLUME 2: PIANO SKETCHES is a limited edition release of 1500 units.